3 months after the last nationwide US tour, GRANNY 4 BARREL is back! It’s no secret that Granny is quickly becoming one of the most entertaining live acts to emerge on the rock scene in recent times. 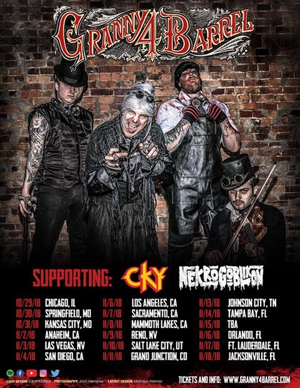 And soon, fans throughout the US will be able to experience Granny in all their over-the-top theatrical glory, when the band opens a string of US dates for CKY and NEKROGOBLIKON. Granny exclaims “It’s my medicine...the more I rock, the younger I feel! You can’t stop The Matriarch of Metal....All the rock n’ roll children out there are in for a real treat! So hold on to your vaginas, ballsacs and whatever else your packin’ and get ready to rock with G4B! Me and the boys are stoked to be sharing the stage with CKY and NEKROGOBLIKON...can’t wait to jam with these crazy f*****s!! !” The tour launched on October 29th at Bottom Lounge, Chicago, IL, and will wrap up on November 18th at 1904 Music Hall, Jacksonville, FL, and hitting many a stop in between. Soon, US rock fans will get to witness what all the hubbub is about, when GRANNY 4 BARREL rock and shocks their way throughout North America!